The P320 Naming Scheme is going to cause Headaches! This entry was posted on December 18, 2014 by OCG. 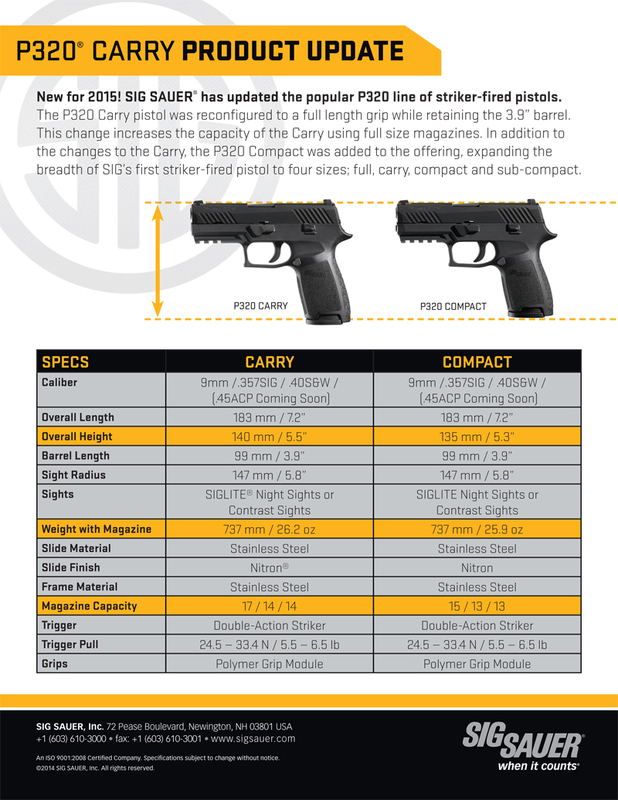 Update 3-16-2015: Sig has released a chart to help illustrate the difference between the P320 Carry and P320 Compact. So... back when we posted our video detailing the P320 and P250, we pointed out that it was strange that the P250 Compact was the same as the P320 Carry in overall dimensions. Well... it seems that this is turning into a real cluster. The gun that we have all known as the P320 Carry is no longer the Carry... What, what? Yup, the gun initially branded as the P320 Carry, including their micro site (still as of this post), calls out the Carry as having a 3.9" barrel and overall height of 5.3". That meets up to the P250 Compact. Now, they've made a new Carry and the old Carry is now the Compact (making it the same size as the P250 Compact). So what is the difference between the 2014 Carry and the 2015 Carry? The 2015 Carry has a full height grip shell allowing for full size magazines (uh oh, that means mag size confusion to follow). It has a 3.9" barrel and that makes the barrel / slide the same length as the 2014 Carry but it is taller (the same height as the full size). You will also notice from the photos below that the grip shell is essentially a full size grip shell cut back to the length of the slide. The 2014 P320 Carry has the same size grip shell as the P250 Compact along with a compact magazine. Why does this matter? Because we, and pretty much every other dealer out there, have been branding the 2014 P320 Carry as a P320 Carry but in 2015 it is a P320 Compact. Because there are tons of websites, YouTube videos (including ours), and photos calling out the 2014 version it will be extremely confusing when you're shopping for one. If you are in the market for a P320 Carry or P320 Compact, you should probably verify the exact dimensions to be 100% sure you know what you're going to get. We will be updating our products as soon as possible so that the names reflect the 2015 Specs. The good news is that if you're just looking at part numbers, the part numbers used in 2014 for the P2014 P320 Carry are essentially converting to the 2015 P320 Compact. If you see a part number starting with 320ca- you know that it is the 2015 version. Adding to the confusion of the naming scheme change, you'll need to pay close attention when ordering magazines or grip shells. We can assume that Sig will introduce another grip shell matching the 2015 Carry grip shell so that those with a 2014 Carry can convert their pistol (or you can use a MAG-MOD-C-9-17-X / MAG-250C-9-17-X which is a full size mag with an X-Grip adapter closing the gap). If you're buying a 2015 P320 Carry, that firearm (firearm part number starting with 320CA-) will accept full size mags. The part numbers start with MAG-MOD-F-. If you have a P2014 P320 Carry (firearm part number starting with 320C-) you'll use MAG-MOD-C- prefix part numbers. It is also worth noting that the P250 mags will work in the appropriate size P320. So a Full Size P250 mag is essentially the same as MAG-MOD-F-, a Compact P250 mag is the same as MAG-MOD-C-, and the P250 SubCompact mag is the same as MAG-MOD-SC-. We will try to make a new video in the near future explaining these changes in detail and we will try to illustrate the correct mags for each pistol variation. This is confusing stuff. Do you still have questions? Leave a comment below! What are the item numbers for the FDE grip shell? Sig has not yet started offering just colored grip shells. Yeah, this was confusing to me as well. I just ordered a P320 from the local firearm dealer yesterday, I knew that Sig had recently changed their naming scheme for the pistolt. They didn't have any P320s in stock so they are ordering one for me, I made sure that when they were showing me the different models that they knew I wanted the Compact with the 15 round mag in 9mm. It took a while until we sorted out what was what from their supplier but they eventually found the right one. Here's to hoping they didn't screw it up and I got the right one hahaha. Apparently very soon. I'd say in the next month or so. Leave it to Sig to stand in the way of thier own success. I appreciate this blog info. Used a Sig 229 as duty piece for decade now, but was contemplating making the jump to Gs. With the P320 striker option, just bought a full size to use as my new duty as my Sig served me well and am accustom to the grip. Envisioned buying complimentary carry gun so was shopping the P320 Carry vs Compact but couldn't get much clear info. Given the info here, intend to go with the, what is now, the Carry option.....not much diff from the compact and can use same mags as my full size 320....(I know,,,,,you glock guys can interchange just about all same caliber mags between models).....and will be same grip. Anyway, appreciate the info.......hopefully this won't confuse/be issues with all the holster makers as well......hopefully, given same barrel length/same upper area/both have rails, one holster may work for the Sig Carry and Compact....? ?